Tomorrow’s the 4th of July and you were probably expecting a patriotic recipe but nope. With everything going on lately I didn’t make one specifically for today. I figured I made two patriotic drinks last week, have many other recipes on the blog, and instead will be doing things this week like these Mini Vanilla Crème Berry Tarts I threw together last week that take as much time to make as popping my rosé! Plus this morning we are getting up early and walking down to the farm to pick strawberries! 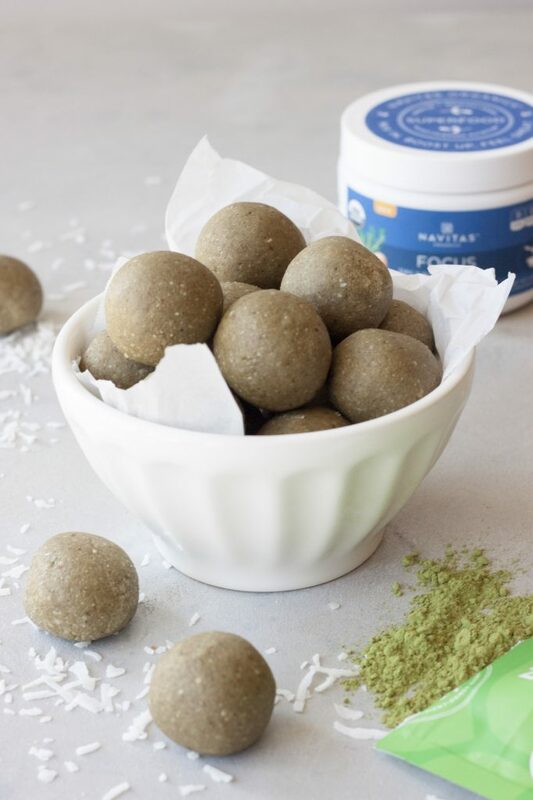 Don’t worry even if it isn’t patriotic and I am on vacation with the family I still have an amazing recipe to share with you today for Meatless Monday, You’ve Met Your Match Matcha Balls! 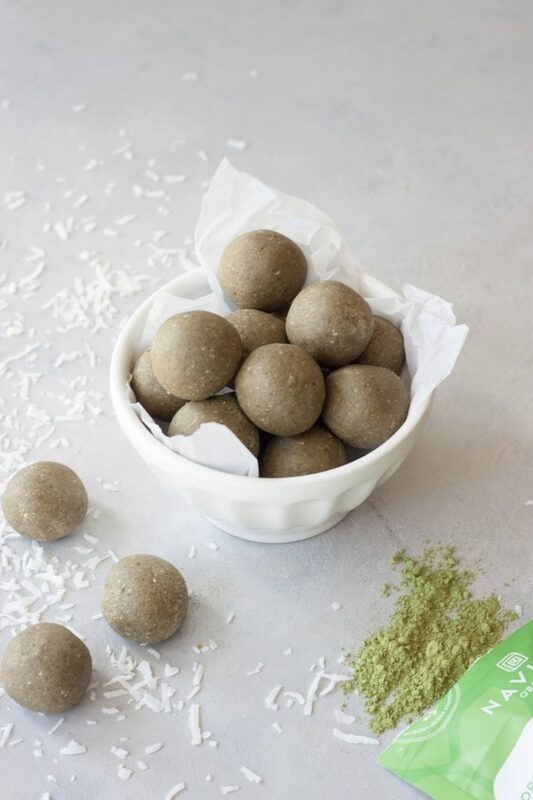 Instead of making more coffee, chocolate, or peanut butter balls I’ve been making these matcha ones lately. I haven’t been making bites or balls much lately and not even close to the multiple times a week that I use to. We go in phases just as I’m sure everyone else does. That said with early morning barre classes and having my class schedules all over the place I wanted to whip some up and I’ve been loving these matcha ones. They fuel me up but are calming, yet energizing, and just hit the spot! Not to mention they are super good for me and pack in the healthy fats and nutrition. I use a variety of nuts and seeds, coconut, dates, coconut oil, matcha and some superfoods, and coconut butter. I make my coconut butter as it’s really easy to do just blending shredded unsweetened shredded coconut in my Vitamix for a few minutes until I get a nice creamy buttery texture. You can make it in a food processor but it will take a little longer and you will need to make a batch big enough to process in your size food processor. I make a jars worth at a time and store it in the refrigerator as I use it for a few things. You can also use store bought if you have it. 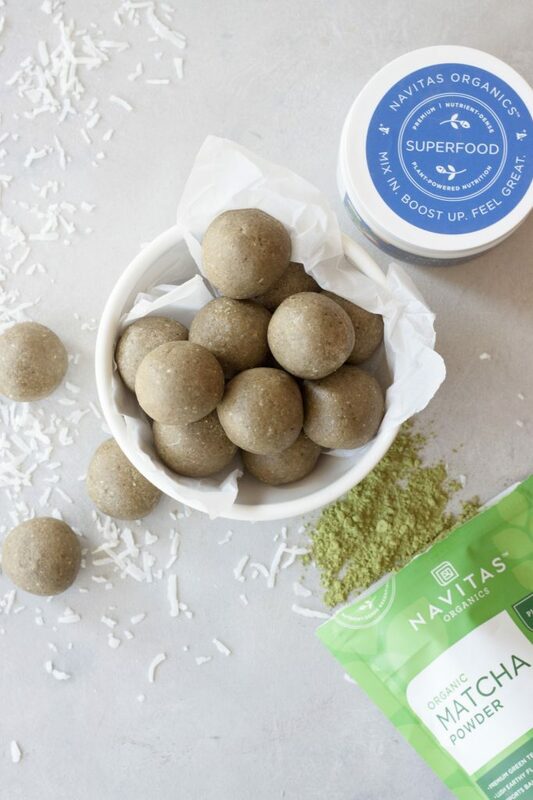 I used Navitas Naturals new organic matcha powder as well as their new Vanilla & Greens Protein, and a new and already favorite Focus Superfood Boost. 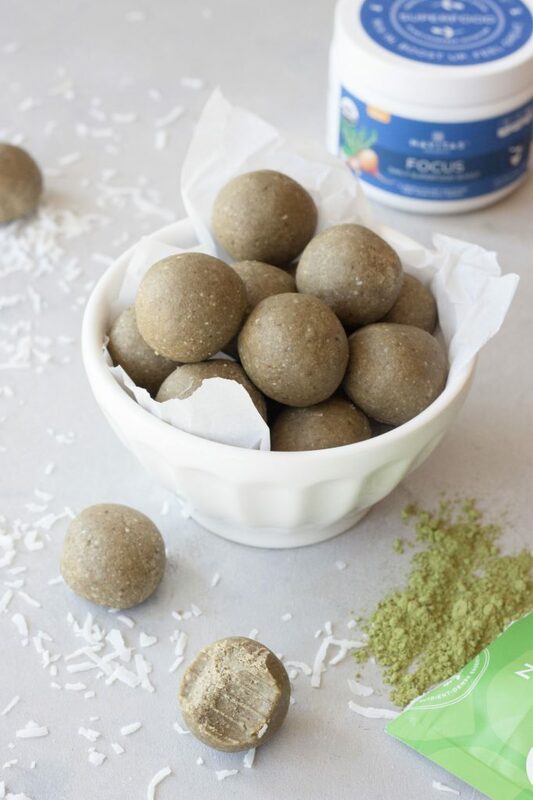 You can use any matcha powder and vanilla protein powder you have on hand. The Daily Superfood Focus Boost is optional but as I said already a favorite and I’ll tell you why, not sponsored as I have said many times when I find a product I love I can’t help but share it with you! So why do I love it? It has so many of my favorite superfoods in 1 container! Funny too since I have a couple bags of Navitas gelatinized maca powder and I had just ordered two jars of Moon Juice Ashwagana before trying this and falling in love. Just a few of my favorites packed in here, maca, matcha, yerba mate, mushroom blend (including reishi) and ashwagandha! The list goes on with acai, mauqi, lucuma, ect. Just what I need early in the morning to get me to barre or in the afternoon for a little boost without lots of caffeine that I’m trying to cut back on. I love my coffee but having it in the afternoon or late at night is something I’m always working on reducing. These aren’t very sweet if you want a sweet treat you can add in more dates and slightly adjust the recipe which I had on my list for afternoons but I haven’t felt the need as these have been good enough for me. 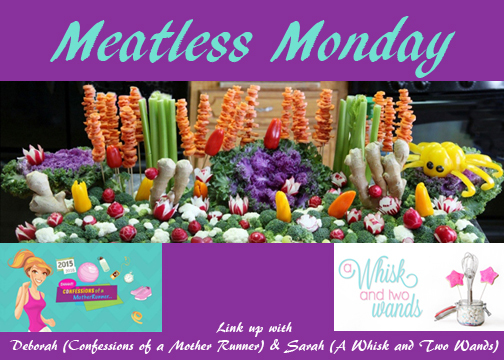 Today is Meatless Monday, and the reason I posted today. Thank you for joining Deborah and me and we can’t wait to see what you are cooking up this week. Need more inspiration, check out the recipes linked up below. I’m still not sure if I will post on Wednesday or later this week or just take the whole week off and spend it with the family. Family time is so important and I hope you are all enjoying time with yours this holiday week. You can follow along on my holiday eats on Instagram (Instagram Stories). If we have down time I will get one posted otherwise I will catch up with you next Monday and I have some pretty good recipes so I’m thinking I will be posting a few good recipes next week! 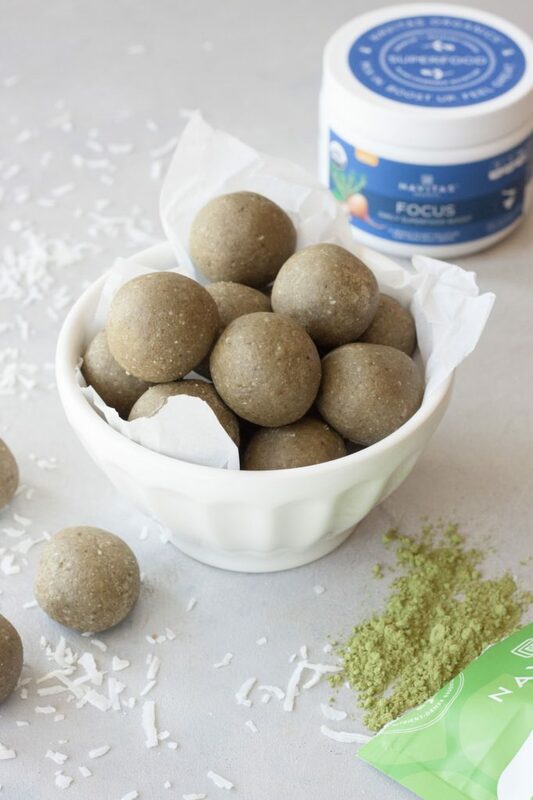 Delicious and healthy superfood packed matcha bites are gluten free, vegan, and paleo friendly. Whole food nutrition balls that are great pre workout or for a snack anytime. Add pumpkin seeds, Brazil nuts, cashews, and almonds to your food processor and pulse to a coarse nut meal texture. Add in coconut and pulse or process to a flour consistency if you want them smooth or a less if you want texture. Add matcha, protein, cinnamon, and optional superfood boost and pulse to combine. Add dates and process until well chopped and you have a consistent texture. Melt the coconut oil and coconut butter and pour into the food processor, process until mixture comes together scrapping down the sides as needed until mixture comes together. Scoop or roll into balls, or place in the refrigerator to chill for 10-20 minutes to chill to make rolling into balls easier. Place on a plate and place in the refrigerator to set before moving to an airtight container. Store in the refrigerator, freezer for longer storage. They are delicious straight from the refrigerator or let them warm up a little. Enjoy! Coconut butter is really easy to make at home, just blend shredded unsweetened shredded coconut in my Vitamix for a few minutes until you get a nice creamy buttery texture. You can make it in a food processor but it will take a little longer and you will need to make a batch big enough to process in your size food processor. These aren't very sweet as is, if you use store bought vanilla coconut butter they are sweeter or you can also sweeten your coconut butter, even adding a little vanilla extract, before adding if you'd like a sweeter treat. This is not a sponsored post but full disclaimer that as a Navitas Organic Insider (Ambassador) I do receive a discount on Navitas products I order online (not those I buy at my local stores)and do receive some new products from time to time to try out. You always have such cute names for your recipes! lol I love it. 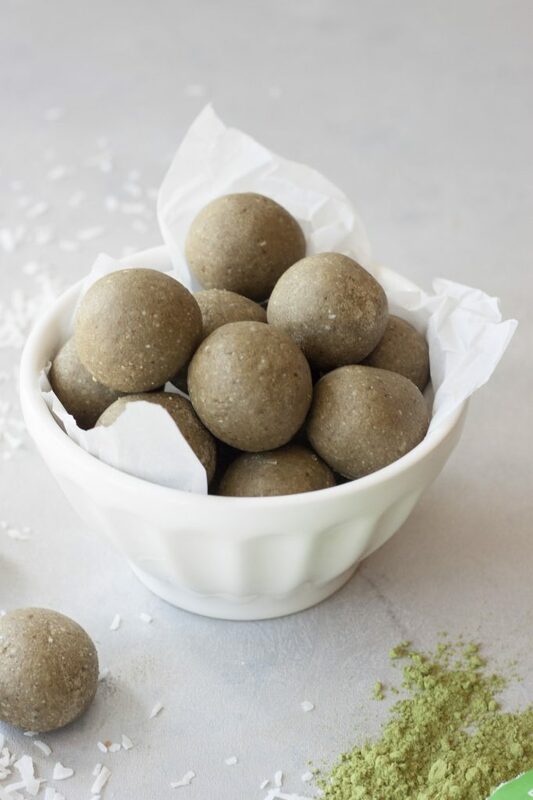 I love that these balls are full of healthy fats and superfoods. Perfect brain-booster snack 🙂 .